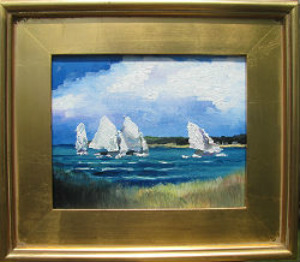 I have been painting scenes of Buzzards Bay and the famous small antique boats that call Buzzards Bay their home. In this painting the subject is a the Herreshoff 12 1/2. Many of these sailboats are moored in Quissett Harbor, Woods Hole and race amongst themselves in Buzzards Bay. Oils give me a freedom that none of the media do. I use the tones as my drawings; I do not rely on the hard lines that I had in the past, and I can achieve results with textures and brushstrokes that weren't available to me with the other media. Plus, I can rely on opaque results instead of the transparent effect of most other media. I always start with a thumbnail in pen or pencil. 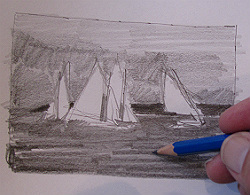 It's a small sketch to work out composition and the contrast; it also indicates where the subjects will be placed. I very rarely sketch on the canvas- so this is an important step for the success of the painting. My sky colors are usually the same, Cobalt Blue, Alizarin Crimson, Yellow Ochre, Dioxazine Purple, and soft mixing white. I always paint "Top to Bottom," "Back to Front." 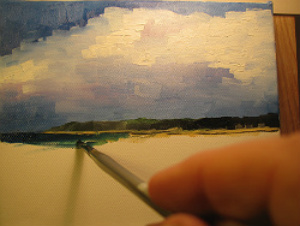 Horizon lines are most critical in any water painting. I usually indicate the horizon line in pencil on the canvas. 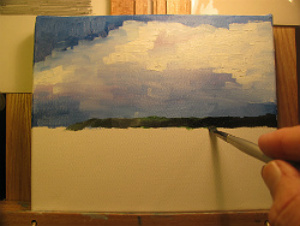 To me, the sky is a very important part of the painting. It sets the mood for the subject. 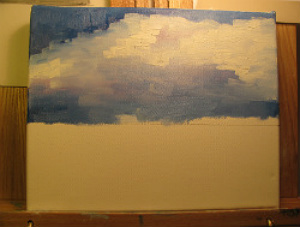 The sky generally takes half of the painting time. 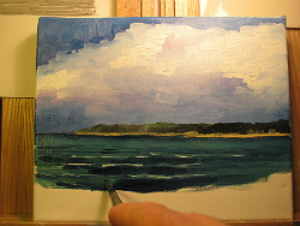 Since the subjects are the Falmouth side of Buzzards Bay, land can be seen in the background, Sap Green and Alizarin Criimson. Naples Yellow forms the coastline, mixed with Cadmim Yellow, Yellow Ochre and white. The water is Prussian Blue, Viridian, Cadmium Yellow, Sep Green, purple and white. It's afternoon, so the wind is up on Buzzards Bay. I try to be as vague as I can be with the sails and the boats. If I wanted it to look like a photograph, I would have used my camera. 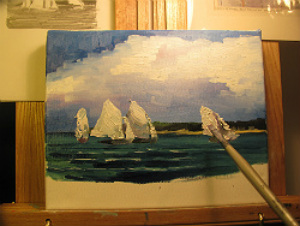 I start with a large glob of white paint on my brush and start to draw the sails with lots of texture. The distinctive shape of the sails on this boat makes my task of indicating without much detail very easy. The rigging is not important in this painting because the sails are the focus of attention. A little grass in the foreground - and a painting ready to frame. Hope you like it. Title "One Minute Horn." Visit Forrest's Studio at 12 Market Street in Mashpee Commons. Original Oil Paintings and Limited Edition Prints on display.